Thymus vulgaris - Natural Health - Lancaster and Preston . Thymus vulgaris is otherwise known as Common Thyme. Thyme is a member of the lamiaceae family and can easily be recognised by it's characteristic smell. It is a perennial low aromatic shrub which grows up to 25 cm tall. The leaves are oblong-lanceolate and the underside of the leaves are covered in fine hairs. The flowers are typical lamiaceae flowers and are pale-purple to very pale mauve in colour. The Romans used thyme medicinally to treat coughs, digestive problems and intestinal worms. 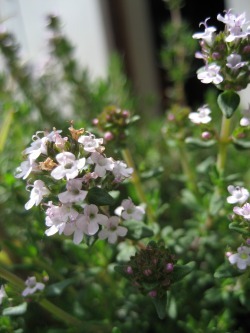 Culpepper used thyme for nervous disorders, headaches and nightmares.